SAFPA once again exhibited at Electra Mining Africa. Although it was slightly quieter than previous years, the exhibition was outstanding, offering a wide variety of products and stands, and the administration and preparation by Specialised Exhibitions was excellent. “We will definitely be attending the next exhibition,” said Brian Townsend from Cost Time Resources. 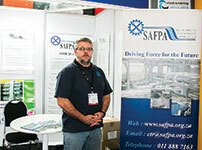 Pirtek’s Wessie van der Westhuizen manning the SAFPA stand at Electra Mining.